Every day we get so much spam in our inbox that we tend to just live with it and automatically filter most of it out. The intention of the majority of this spam is to somehow defraud you. It might be to get your banking details, the details for your email account or just to simply drop a virus onto your computer. To do this, the creators try their hardest to make their email look as much like a genuine email from well known companies such as eBay, Microsoft and FedEx and of course, banks from all over the world. Many times you can spot the fraud because of poor grammar or spelling mistakes. With emails supposedly from banks, you can pretty much ignore them right from the outset because banks will never ask you to verify via email. But sometimes when you look at an email, you think to yourself, this is either an excellent fraud or it’s a genuine email… so then you are stuck. You don’t want to try clicking on the link in the email because it might take you to a fake website just waiting to harvest your details. Check out the example above of a fraudulent spam I just fished out of my junk mail folder. It looks pretty legitimate. It has a genuine PayPal and eBay logo. There are no spelling or grammar errors. 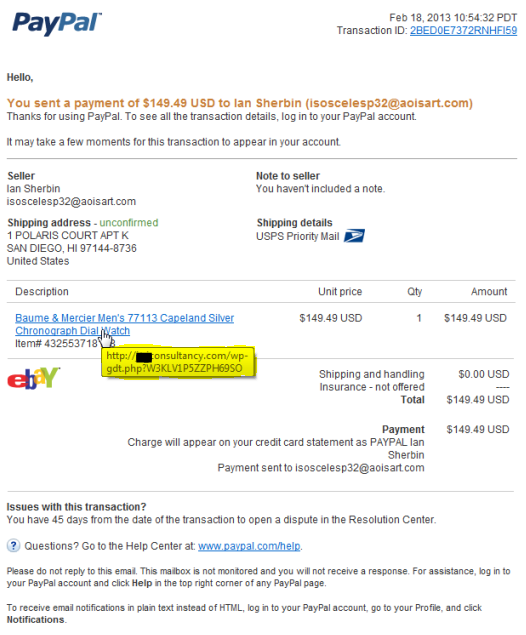 You could imagine the potential for a regular eBay purchaser to receive this email and think, What’s going on here? I don’t remember sending any money to this Ian Sherbin guy. Maybe I made a mistake… or maybe my account has been hacked! Hang on, I do remember looking at watches but I don’t remember buying one. I’ll click on the link and find out more. And WHAMMO, you’ve just gone to a website that was waiting to drop a virus on your computer. In this particular case, it takes you to the website of a legitimate purchasing and supply chain consultancy which has obviously been hacked (usually due to poor security on the website) for the purpose of infecting visitors with a virus. Do you have to be an expert to tell the difference? Once you know what you are looking for, in most cases, it is actually pretty simple to tell the difference. Most email clients (eg, Microsoft Outlook) can show you previews of the website address that a link in an email intends to take you to. It Outlook for example, all you have to do is put your cursor over the link and leave it there for a second. After you’ve paused there long enough, the web address will show up as a tooltip. You can see in this example that hovering the cursor over the description of the purchase has brought up a tooltip (I’ve highlighted it in yellow) that gives the web address http://xxconsultancy.com/wp-blah-blah-blah. I don’t know about you, but that doesn’t look anything like an eBay address to me (it doesn’t even look like a PayPal address). 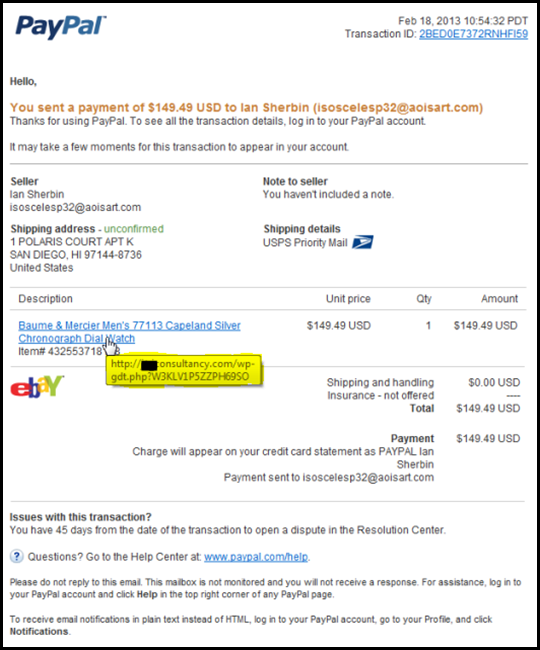 When I put my cursor on the “Transaction ID” link and the “www.paypal.com/help” link, they also came up with tooltips showing different webpages but at the same domain. Very apt suggestions – as you say – this defrauding people is becoming big business, and people can be anywhere in the world sending these type of emails. Great topic. Yes! I see so much of it every day. It is usually difficult to tell where infections have come from when I am cleaning them off client’s computers, but my suspicion is that the vast majority arrive via fraudulent emails. Constantly i check weblog posts here early in the dawn, for the reason that i like to find out more and more. No problems, Eliza. You’re very welcome, glad you enjoyed it.